It was a balmy July evening when we passed by Yalla Yalla. It felt as if we really could have been in Lebanon (that’s me presuming that Lebanon has a warm, mediterranean climate like the UK has been experiencing recently!) This feeling was strengthened by the decor and outdoor seating on offer, and topped off by the yummy, traditional fare that excited our taste buds. It was a treat. 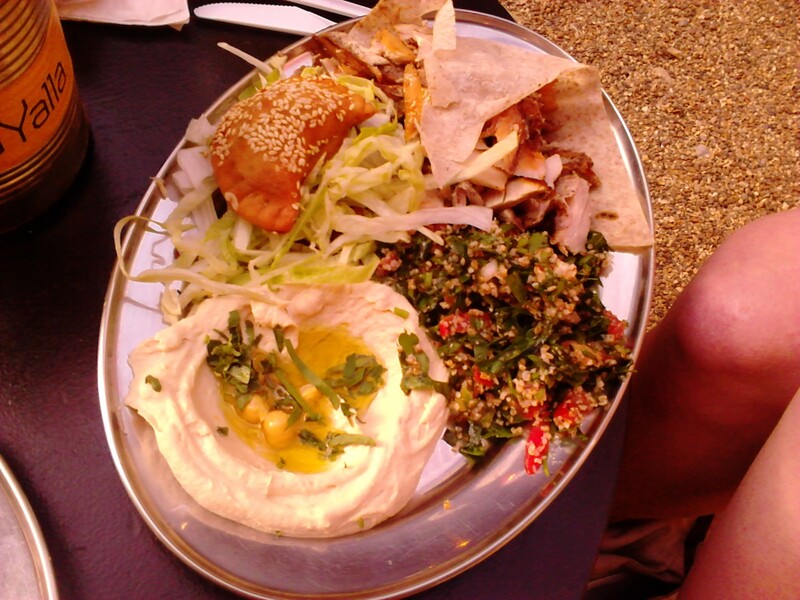 We each opted for a mezze platter – one street platter, one Beirut platter – which came served with pitta bread. 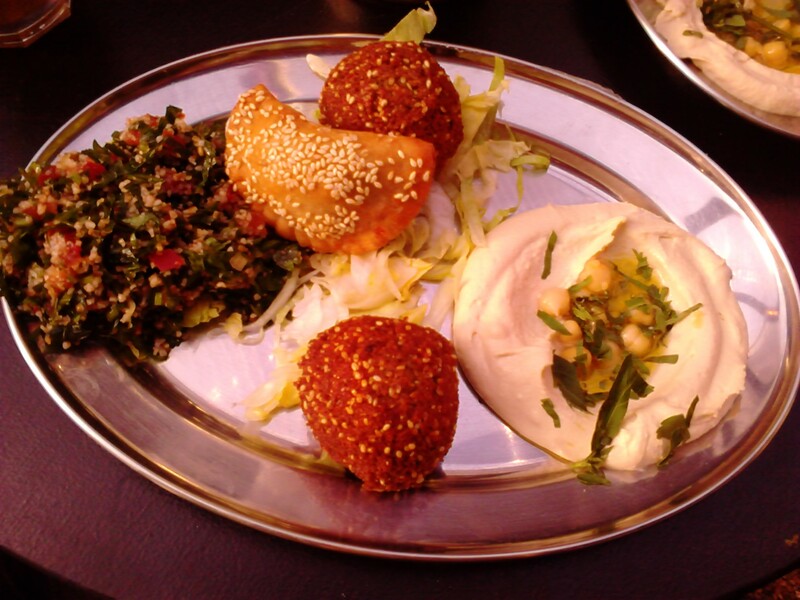 Both comprised of hommos, tabboule salad and samboussek jibne (a tasty combination of feta, halloumi and mint in a pastry parcel). Beirut platter also had falafel, while the street platter included chicken shawarma (thin slices of marinated chicken with grilled tomatoes, pickle and vermicelli rice), described as “succulent, nice seasoning” (Lucas, R, 2013). We both drunk homemade apple, mint and ginger lemonade which was perfectly refreshing on a hot summer’s day. So the food was great, however we do have a couple of qualms when it comes to the environment. Firstly, the loud music they had pumping out, we had to shout in order to hear one another! And secondly, the chair/table arrangement. The stools were quite uncomfortable and the tables were so low down that we were stooped over our meals. Service 6/10, food 9/10, environment 6/10. This entry was posted in Uncategorized and tagged Dining, Dinnergeddon, Eating out, Food, Lebanon, London, restaurants, Shoreditch, Yalla Yalla by dinnergeddon. Bookmark the permalink. they were just trying to re-create how things would be if you were in Beirut!! haha, are uncomfortable seats a policy over there?